General Information About Corporate Hub Thank you for choosing/purchasing our theme. We are happy that you are one of our customers and we assure you won't be disappointed as well. We do our best to produce top notch themes with great functionality, premium designs and human readable code. Before you get started we highly encourage you to get familiar with this documentation file. Spending half an hour reading the manual may save lot's of your time and avoid questions with obvious answers. We also recommend to check our Knowledgebase and FAQ pages If you have any questions that are beyond the scope of this help file, please feel free to post your questions on our support forum. PLEASE NOTICE! Our support covers getting setup, trouble using any features, and any bug fixes that may arise. Unfortunately we cannot provide support for customizations or 3rd party plugins for free. If you need help with customizations of your theme then you should enlist the help of our professional team. Wordpress FAQ - Information and resources about WordPress including history, features, semantics, glossary, and information to help you determine whether or not WordPress is the blogging tool for you. Setting these values will ensure you wont get an error reporting that your upload and post memmory limit is too low. Activate the newly installed theme. Go to Appearance > Themes and activate it. Go to Appearance - Themes and click on the Add New button. Choose Upload theme option. Click on Browse...(Choose file in Safari/Chrome), select the "corporate-hub.X.X.X.zip" (X denotes version no) and click in Install Now button. After successfull installation click on Activate or go to Appearance - Themes and click on Activate to activate the newly installed theme. We've used Wordpress Default menu options to add Social icons. 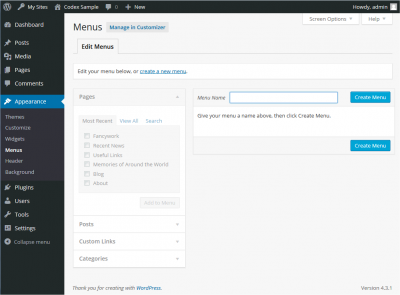 If you're familiar with "WORDPRESS" menu options then its relatively easy task for you. To create a custom menu is actually really simple. 1. Login to the WordPress Dashboard. 2. From the 'Appearance' menu on the left-hand side of the Dashboard, select the 'Menus' option to bring up the Menu Editor. 3. Select Create a new menu at the top of the page 4. Enter a name for your new menu in the Menu Name box 5. Click the Create Menu button. After the menu has been created You've to add social site URL and Link Text from Custom Links sections and click OK: Note: Step no.3,4,5,6 is important. Also as on point no.5, you've to select Social Menu before you click save changes. Important: [Point no.3] Please add full URL (e.g http://www.facebook.com/username) for site URL on Custom Links sections. This section discloses the sources of various files used within the theme and describes their function. Use this section to gain an understanding on how the theme functions behind the scenes if considering any type of modification. Fonts: Roboto (non standard) All images are copyrighted to their respective owners and not available for download with this theme.